By giving a Gold Award to The Power of Latino Leadership, Nautilus is recognizing the cultural contributions that Latinos are making to America. There are over 50 million Latinos in the US and it is estimated that by 2050 one in three of the US population will be Latino. In Colorado today more than one in five people are Hispanic. Yet there is scant information on the powerful way Latinos have led their community or the contributions they have made. Latinos have only advanced because of the relentless work of their leaders and their collective efforts. The Power of Latino Leadership is a journey to the very heart and soul of Latino leadership and offers ten principles that illustrate the inclusive, people-oriented, and community-centered way Latinos lead. Bordas claims this model is well-suited for the multicultural and global century in which we live and offers lessons for leaders of all backgrounds. A long-time Colorado Latina leader, Bordas is a founder of Denver’s Mi Casa Resource Center and was the first President of the National Hispana Leadership Institute. In 2009, Juana was named Colorado Unique Woman of the Year by the Denver Post and the Colorado Women’s Foundation. 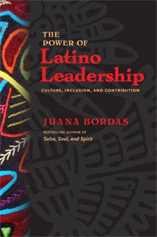 The book highlights Bordas’ own experiences and includes the voices of 9 renowned Latino leaders including: San Antonio Mayor Julian Cástro, Janet Murguia, President of National Council of La Raza, and former Denver Mayor Federico Peña.